The finished beer - look at the carbonation! A few months ago, I placed an online order for two batches of grain. One was for an English Dark Mild Ale, the other for a Bohemian Pilsner. As it turned out, I screwed up the order and ended up with a bag of mixed German and Belgian grains. After pondering what to do about this, I decided to try turning the mix into a Trappist Dubbel. The color and malt combination wasn't too far off. I added Munich malt to sweeten it a bit, Special B to add raisin/prune/plum flavors, plus Melany (Melanoidin) and Cara-Pils for head retention. Since I had some dark candi sugar rocks I wanted to use up, I included those. I also included some chopped golden raisins and prunes to (I hoped) help punch up the dark fruit flavor - something that's been sorely lacking in my previous Dubbels. I'm not sure this will be a true Dubbel in terms of its specifications, but I'm hopeful it will still turn out to be a tasty brew. Why Whitbread Golding Variety (WGV) hops? I happened to have them on-hand and my Styrian Goldings hops were very low alpha (1.3% if you can believe that). Why US Saaz hops and not Czech Saaz? When I opened my Czech Saaz hops package, I couldn't get past the fact that the aroma reminded me of cheese or soap, meaning they had gone bad. I tossed them and opened a fresh package of US Saaz I'd bought more recently. Those smelled fine. Why Wyeast 3787 and not another yeast? 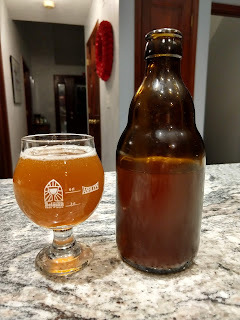 Honestly, I happened to have a batch of the yeast leftover from a previous starter and knew it could make a good Belgian style ale. I split half of what I had (eyeballing it) into a fresh starter to grow more, and retained half to pitch into this wort. If the wort doesn't take off, I've got a starter I can use to try again. If you've looked at the BJCP style guidelines, they'll tell you a Dubbel should not exceed 17 SRM. Most of my favorite (genuine Belgian) Dubbels have been much darker than 17 SRM. It's my belief that the BJCP guidelines are far too restrictive in terms of color for this style, so I'm choosing to ignore them. A few genuine Belgian Dubbels are very dark brown, with a reddish hue to them. I'm aiming for a color somewhere between those very dark examples and the BJCP guidelines, as I'm hoping this will achieve the flavor I'm looking for. 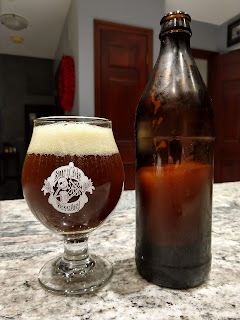 When I've tried brewing to the lighter color in the BJCP guidelines in the past, the beers always come out more like a bland, mild brown ale than a solid Dubbel. One of my favorite Dubbels is about 32 SRM, so this one is coming in a hair lighter at 31.4. The pH 5.2 Stabilizer and a half-teaspoon of Brewtan B were added into the grain bag at mash time. The Brewie was configured to automatically chill the wort to 68F after the boil was complete. (In practice, it came in around somewhere around 74F in the fermenter. Having used Wyeast 3787 a lot lately, I'm very familiar with its need for a blow-off tube, so I'm starting on the assumption it's needed here as well. My plan will be to ferment the beer in the middle of the yeast's optimum range (64-78F), then once fermentation starts to slow down significantly, I'll raise the temperature up to the top of the yeast's range to maximize its flavor and aroma contributions - as well as helping it reach final gravity. I'll treat the beer with Gelatin Finings and cold-crash it for a few days before bottling. 12/31/2018 1:30am: The beer came in closer to 2.5 gallons in volume than any previous batch. I'd have to say it was in the vicinity of 2.4 gallons. Gravity originally read as 1.074 SG using the Tilt Hydrometer. I diluted the wort to 2.5 gallons, at which point the gravity read somewhere in the 1.072-1.073 range. With a bit more water, I got it to hit my 1.070 SG target and come in a little over 2.5 gallons in volume. I need to tweak my spreadsheet a bit more, probably adding another tenth of a gallon or so. Then again, I did run most of the boil on this batch with the Brewie's lid open to encourage boil-off, as it looked like I might have had too much wort after the sparge. It's possible the calculations are on-target now. Into the wort, I pitched about half of my reserved Wyeast 3787 Trappist High Gravity yeast from a previous 1L starter (used for the Barrel Aged La Trappe Quad Clone earlier). The other half was pitched into a new starter wort to grow into more yeast for future use. If this beer doesn't start showing signs of fermentation in about 18 hours, I'll pull some of that starter to "perk things up" in the fermentation. The beer was 73F at the time I pitched the yeast slurry into it, which is just above the midpoint of the yeast's optimum range (71F is the approximate midpoint). With the ambient basement temperature this time of year in the 63-65F range and a stainless fermenter being used, I'm expecting the temperature to decline quite a bit before the yeast really kicks into high gear in 12-24 hours. If that proves to be wrong, I'll use my temperature control setup to cool things down as needed. 1/3/2019: The gravity now reads 1.024 SG, which makes the beer 6.4% ABV, right in range for a Belgian Dubbel. If it holds at this gravity for another day or two, it will be ready to bottle. 1/4/2019: Gravity is down to 1.022 SG today. which represents an ABV of 6.7%. 1/6/2019: Gravity is down to 1.021 SG today, which represents 69% attenuation and an ABV of 6.8%. I decided to go ahead and bottle it. A taste test at bottling showed a nearly cloying sweetness and a rather interesting flavor. We'll see where things are in a week or so. 1/12/2019: I opened a bottle of the beer tonight (photo at top of post). It was so carbonated that it pretty much foamed over the top before I poured it. It pours a nearly opaque reddish brown with huge head that lasts quite a while (thanks to the Cara-Pils and Melanoidin). Aroma is noble hops and malt. The flavor is intense and complex, far more than I expected. It starts intensely malty and sweet, maybe even a bit too sweet. Right behind the malt, we get the prune and raisin, and a nice hit of dark chocolate, with a touch of roasty malt slipping in. It's good, but next time I'd let it ferment out more before bottling so that it would dry out some and not be quite so carbonated. I would also dial back the Munich, maybe by half. Having seen the success of my high-gravity ale experiment, I decided to take the process to another level. This time around, the goal is to produce a relatively authentic British Old Ale in terms of its grist, but dial the alcohol content up considerably. The goal here is a 16% ABV and retention of the basic flavors of an Old Ale. I'm well aware that an ABV over 9% puts this beer way outside the upper end of the Old Ale qualities in the BJCP criteria. My goal wasn't to produce a beer for competition but to try to produce a very high gravity version of an Old Ale for personal enjoyment and learning. The boil would begin immediately following the sparge. After the boil, the Brewie was instructed to chill the wort to 68F before pumping it into the fermenter. Based on my past experience with the 20% experimental beer, I planned to follow a similar schedule with this beer. That means holding the beer at 65F until it's finished or seems to be stalled, then increasing to 69F until it finishes out. 12/28/2018: I decided to raise a nice starter of WLP099 before pitching into the beer. After brewing, it registered 1.135 SG (exactly on target) but the volume came in a bit below the intended 2.5 gallons. Since the gravity target was hit, I decided not to dilute the beer but to leave it as-is for fermentation. Although the yeast starter (begun around the same time as the beer) already shows activity, I'm not willing to pitch it into the wort yet. I'll do that in the morning when the wort has cooled down from its current 73F to something in the yeast's 65-69F range. 12/29/2018 11am: Added half the yeast slurry from the starter into the beer. I was in a bit of a hurry at the time and did not let the yeast settle out. This was a mistake, as it dropped the gravity from 1.136 down to 1.113. That will knock the ABV down to perhaps 12.9%. I'll probably make that up with some honey when the gravity has dropped far enough. 12/30/2018: Added some yeast nutrient and glucoamylase to the beer to help encourage the yeast to finish out the beer. For a while, and as I've seen in other big beers, gravity showed a big increase on the Tilt Hydrometer for a while, then started to drop back down. For a time, it went from 1.095 up to 1.109 and began going back down. It's currently reading 1.100. 1/3/2019: The gravity has since dropped to 1.039 SG (around 65% attenuated from the original 1.113 SG). I added enough honey to raise the gravity back up to 1.061 SG, adding approximately 22 SG points' worth (about 1.3 pounds). This makes the original gravity "effectively" 1.135 SG (my intended original gravity) for the purpose of calculating ABV after fermentation. In addition to the honey, I also added 30 seconds of pure oxygen and some yeast nutrient, stirring the wort hard to mix in the new sugar. The temperature has been increased to 67F to help encourage the yeast to finish up. There was a nice thick krausen on the wort when I sealed the fermenter back up, so I'm hopeful it will finish up fine. If it hits the estimated 1.018 SG final gravity, I'll have the 16% ABV beer I was aiming for. 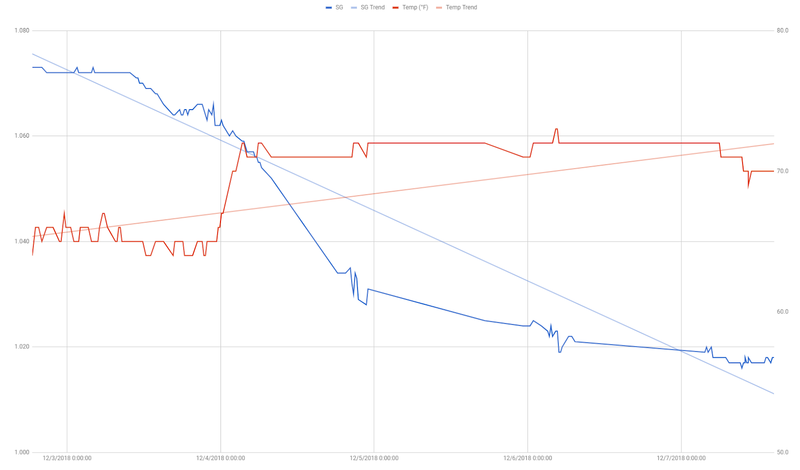 1/4/2019: The gravity has dropped from 1.061 SG yesterday to 1.052 SG today. That works out to a current ABV of 13.07% on the Brewer's Friend ABV calculator, with the alternate formula. 1/5/2019: Gravity is now showing as 1.046 SG. I've added yeast nutrient and some glucoamylase enzyme, then swirled the fermenter to rouse the yeast. The blow-off tube is still "burping" regularly so the yeast are still happy and healthy. ABV now calculates as 13.94%. I raised the temp up to 68F to help keep the yeast going. 1/6/2019: Gravity has dropped to 1.043 SG today. That's 66% attenuation and 14.51% ABV. The temperature is holding at 68F. I learned with my previous high gravity batch that adding a second yeast strain late in fermentation helped the beer finish fermenting. Today I rehydrated some Montrachet wine yeast, added yeast nutrient to that, and added it to the fermenter. 1/8/2019: Gravity has dropped to 1.036 SG today. That's 71% attenuation and 15.36% ABV. I added some yeast nutrient dissolved in a tiny amount of distilled water and swirled the fermenter to keep the yeast suspended in the beer until (hopefully) the final gravity of 1.018 SG is reached. 1/9/2019: Gravity is now 1.032 SG, which is 15.91% ABV (just shy of my original goal of 16%) and represents an attenuation of 74%. The beer is now 14 SG points short of the expected final gravity. If it reaches that, we'll have 17.83% ABV. If it reaches 1.022 SG and still seems to be fermenting, I may bottle it to see if it will finish out and naturally carbonate in the bottle. 1/10/2019: Gravity is now 1.029 SG, which is 16.33% ABV and 77% attenuation. 1/11/2019: Gravity is now 1.027 SG, which is 16.6% ABV and 78% attenuation. 1/12/2019: Gravity is now 1.026 SG, which is 16.74% ABV and 80% attenuation. According to White Labs, WLP099 can attenuate 80-100%, so the yeast is likely to start slowing down soon. Attenuation isn't available for the Montrachet yeast, so it's hard to know how it might affect attenuation. I do have some concern that Montrachet is known to produce a lot of sulfur (something I didn't know when I pitched it). Hopefully this will dissipate and not end up in the bottle. 1/14/2019: Gravity is down to 1.024 SG, which is 17.02% ABV and 81% attenuation. This is only 6 points from the expected final gravity of 1.018. 1/17/2019: The gravity was down to 1.023 SG (17.15% ABV). I swirled the beer around this morning to help keep the yeast in suspension. The blow-off container had begun to grow mold, so I emptied that and replaced it with a clean container. 1/26/2019: The beer was transferred into a sanitized 2.5 gallon corny keg and pressurized to 15 psi. The keg was moved and rolled around until the bubbling sounds stopped. It's now in the mini-fridge where the temperature should reach approximately 36F and the pressure was reduced to 10 psi. This should get me a carbonation level around 2.3 to 2.5 volumes of CO2 in about a week. At that point I'll see about bottling it for long-term storage. A sample of the beer from the last part of it in the fermenter after the transfer to the keg had an aroma that reminded me of Acai juice, which also seemed to come through in the flavor, along with the dark malt and treacle. It had a nice complexity to it, and I'm looking forward to seeing what it's like carbonated (and with 6-12 months of aging). 2/2/2019: The beer spent a week absorbing CO2 in the keg. Today, I attached a tap to the keg and dispensed a sample of the beer. It had a nice low-to-medium level of carbonation. I then used a growler filler to transfer the now-carbonated brew into 23 twelve-ounce bottles and 1 16-ounce bottle. Each bottle was immediately capped as it was filled to help preserve the carbonation. I plan to allow these to age for several months before serving. 2/3/2019: I poured a bottle tonight to take the picture at the top of this post. The aroma is fruity and boozy, with a wine-like note to it - most likely from the White Labs WLP099 yeast (which White Labs says will generate a vinous note above 16% ABV). The flavor is malty, reminiscent of a white wine, with a balancing amount of hops bitterness. The finish mixes malt, treacle, and wine in a way that resembles a mixed drink to me. The carbonation isn't as obvious or good as it seemed before I bottled it, so I'm wondering if I should have used a second CO2 cartridge on it... something to consider for next time I brew one of these bigger beers. My step-son and his fiancee love big, citrusy IPAs. They would like me to brew one that could be given away as a favor to guests at the wedding. Not being a fan of IPAs in general, I don't have a recipe ready. Even if I did, I'd want to put a twist on it so that it's unique to them. My plan is to mix barley, wheat, and oat malts to get a nice body in the finished beer. They've asked me for a citrusy IPA, so I'm going to use a blend of Amarillo, Mandarina Bavaria, and Cascade (which all have citrus flavors in them) late in the boil. Although there's not really a whirlpool stage in the Brewie's process, I'm planning to drop the hop cages into the kettle during chilling to simulate that effect. I'll use an English Ale strain for the esters. This all fits within the NEIPA style. Periodically during the mash, I would move the bag around a bit and poke it gently with a plastic grain scoop to help ensure the mash water was flowing through and around it. I hoped this might help with starch conversion. The Brewie+ will chill the wort down to 65F in preparation for fermentation. The plan is to keep this toward the lower end of the yeast's optimum temperature range (65-72F) to minimize the production of esters. Lallemand ESB yeast is a medium attenuation strain with low flocculation, which should make it a good fit for the style. When the gravity is down into the 1.028 to 1.020 range, I'll add dry hops (one ounce of each of the hops used in brewing) to add aroma. When the final gravity is reached, I'll bottle with 1 large carbonation drop (medium carbonation) per bottle and hold it at ambient basement temps until carbonation completes. 12/27/2018: I began the brew day by re-calibrating the Brewie+ weight sensors to ensure that it loads the correct amount of water into the mash and sparge processes. This took longer than I remembered, but it's recommended to do this occasionally. I think I've made four batches in it since the original calibration, so it seemed like a good time to re-calibrate. This recipe uses a bit more hops than I think are recommended for the Brewie+, but since I plan to drop them into the wort after boiling to simulate whirlpool hopping, I'm hoping that will be OK. I'll plan to be with the machine at the end of the boil to be sure. 10pm: The beer came out high on gravity and low on volume. I added steam-distilled water to it, which brought the volume up to 2.5 gallons and dropped the gravity to 1.069 SG, which is exactly where I wanted it to be. The temperature was 71F at that point, within the yeast's range of 65-72F. I sprinkled the dry yeast on top and sealed up the fermenter, without temperature control for now. With the basement in the 63F ambient range, the beer's temp should get quite a bit lower before the yeast kicks in. I'm hoping it can free-ferment, but we'll see. The kettle had a nice grapefruit/citrus aroma during chilling. Unfortunately, this was a lot of hops for the Brewie+ to handle. There was quite a lot of hop residue in the bottom of the kettle at the end of the boil, enough that I actually scooped a lot out before running the cleaning cycle. I ran both a Sanitizing and a Full Clean cycle after this batch to do my best to get the Brewie clean for its next run. 12/29/2018: The beer is now reading 1.030 SG and 66F. Gravity is dropping much more slowly now, so I may need to increase the temp to encourage the yeast to finish out the last 14 points or so. 12/30/2018: I added a packet of US-05 yeast to try to encourage the last few points of gravity to ferment away. Gravity is reading 1.027 SG. I also added a half-ounce of Amarillo and Mandarina Bavaria hops to dry-hop the brew. 1/3/2019: The US-05 was apparently overkill for this beer. It has fermented down to 1.003 SG, making the beer 8.5% ABV instead of the intended 7.0%. If the gravity holds until Saturday, I'll bottle it. 1/6/2019: Gravity is reading 1.002 SG now, and has been holding at that figure for about two days. I've decided to go ahead and bottle it, as I doubt it can get much lower. I bottled it with 4 small carbonation tablets per bottle (medium carbonation) and placed it in a 69F "hot box". 1/12/2019: I opened a bottle of the beer tonight to check in on it. The beer seems to have carbonated nicely. The hope flavors seem a little less bright now, but present. A little diacetyl was detectable, but that should go away in a little while. 1/19/2019: I removed the beer from the "hot box" I'd been keeping it in so that I could raise the temperature for another beer that's in the box and hasn't carbonated. I've found in the past that beers seem to age faster when kept in a warm environment, and that would spell the death of an IPA or Pale Ale. When I bottled my (non-oak-aged) La Trappe Quadrupel clone on Friday, I decided that I was pleased enough with it to try using the recipe to make a clone of the oak aged version, too. Tonight, I put the Brewie to work on it. My plan is to soak oak chips in Everclear for a few days, then add those late in the primary fermentation. When the desired oak flavor is achieved, I'll bottle the beer and give it some time to age before sharing. This recipe is a slight change from the previous version, intended to raise the alcohol content but otherwise maintain the flavor of the original. Brewie estimated that the entire brewing process would take 6.25 hours to complete. Given that I was starting it at about 5pm, that meant it would be after 11pm before it finished. Since the recipe included Pilsner malt, it seemed worthwhile to have a longer boil to drive off any DMS the malt produced. In addition, this would help concentrate the wort if gravity came up low. I could always dilute with distilled water if it came out high. At the end of the brewing process, I asked Brewie to chill the beer to 70F after the boil. It should have no problem with that, given past experience. I'll start pulling small daily samples starting around 12/21 to check the oak flavor level. When it appears to be optimal, I'll bottle the beer with 5 carbonation tablets per bottle (high carbonation). 12/16/2018: At 9 pounds and 14 ounces of grain (plus 8 ounces of rice hulls), this is the largest grain bill I've used in the Brewie, and larger than anything I could have done in the Zymatic. When I brewed the original clone batch, I split the fresh package of Wyeast 3787 between the batch of beer and a Fast Pitch Starter Wort. After 24 hours on a stir plate, I chilled the flask in the fridge, decanted off most of the clear liquid and kept the rest in a sealed jar. Tonight I split off half the contents of the jar to use for this batch, and put the other half in a fresh starter to keep myself supplied with it. If the amount I pitch into the beer turns out not to be enough, I'll use some of the fresh starter to get the beer going. I've modified my mash and sparge water calculation sheet for the Brewie based on my recent brewing experiences with it. As with the Zymatic, I always seem to come up about a quart short when the brew is over. After adjusting the sheet, I entered the numbers for the last two batches I did and got back a result that was very close to the actual "wort in fermenter" amount. Sadly, I've had to adjust the efficiency setting in BeerSmith down to about 50% to account for the low efficiency of the Brewie system. Adding rice hulls and adjusting to a smaller crush last time seemed to improve efficiency some, and I'm hoping this batch will get closer to my gravity and volume targets. Hitting those targets is key to repeating your results and gauging the effect of recipe changes. 11:30pm: The Brewie delivered on its promise to be finished brewing at 11:15pm. At that point it had mashed the grain, boiled the wort, and chilled it down to 70F. I had quite a surprise when I pumped the wort into the fermenter, though. Instead of 2.5 gallons, I ended up with a considerable amount more. I filled the fermenter almost to the top and pumped an unmeasured amount down the drain. I sanitized two quart jars and filled those with wort. That left 2.75 gallons in the fermenter. The gravity of this wort was 1.085 SG, considerably lowed than expected. The question now is whether this was a problem with the calibration of the machine's weight sensors, or a miscalculation in my updated spreadsheet. I pitched the yeast into the wort and connected the temperature control system, setting it to 65F. I'll have it hold that temperature until Tuesday night (assuming the fermentation is well underway by then). 12/17/2018: The Wyeast 3787 Trappist High Gravity yeast has a reputation for slow starts and explosive fermentation. There was no change in gravity for about 10 hours after pitching some of my reserved and re-grown yeast from the original package. As of this writing, gravity has dropped from 1.085 SG down to 1.078. There is a thick krausen on the beer and the blow-off tube is constantly bubbling in the water bucket. The temperature control system is keeping a consistent 65F as planned. Tomorrow night I'll bump that up to 67F. 12/18/2018: The yeast is going nuts at this point. It's blown enough into the blow-off tube that large sections of it are tan (yeast) colored and the water in the blow-off jar is milky white. Gravity is down to 1.051 SG. I raised the temperature to 67F to help coax the yeast along. Tomorrow night, I'll bump it up to 71F. 12/19/2018: Gravity is registering 1.050 SG today. The temperature has been increased to 68F to keep nudging the yeast along. 12/21/2018: Gravity is down to 1.028 SG today. To help encourage the yeast to keep going, I've raised the temp to 75F. 12/22/2018: Gravity is reading 1.030 SG now. 12/23/2018: Gravity is now down to 1.026 SG. 12/28/2018: Gravity had dropped to 1.019 SG and held there for a while. I transferred the beer to a sanitized secondary fermenter into which I placed a quarter ounce of plain oak chips and a quarter ounce of brandy barrel chips (inside a sanitized stainless steel dry-hop container) to begin the "barrel aging" phase. 12/30/2018: A sample extracted from the fermenter had a decent blend of oak and brandy flavors combined with the Quadrupel itself. I'm hopeful that with another day or two of aging we'll hit a good flavor profile and be able to bottle it. 12/31/2018: Gravity is reading 1.024 SG, which is up from its low of 1.1019 on 12/28/2018 when I transferred it to secondary with the oak chips. 1/4/2019: Gravity has held at 1.024 SG. I've been tasting the beer daily, to see how the flavor is coming along. It's good today, but it seems like it might be starting to pick up some tannins, so it it may be time to bottle soon. 1/6/2019: I rehydrated some CBC-1 bottle conditioning yeast and added some leftover wort to it along with a pinch of yeast nutrient. When it began to krausen, I added five small carbonation tablets to each bottle and a pipette full of the yeast slurry, then capped the bottle. After it was capped, I turned it up and down a couple of times before placing it in a 76F "hot box" to carbonate. Appearance: Cloudy, orangey gold color with thin beige head that doesn't stick around long. Aroma: Slightly fruity Belgian yeast "bubble gum" flavor mixed with oak and brandy. Flavor: Sweet brandy comes through initially, then oak, ending with nicely balanced fruity/malty finish that lingers pleasantly and melds with the oak. Mouthfeel: Medium and honestly a little flat, but a little creamy also. Hopefully with more time in the bottle we'll get more carbonation and a better mouthfeel. I think in a future version I would add an ounce or two of Special B malt to darken it a little, and maybe add a little complexity on the malt side. I might also consider using gelatin finings to clear it up and bottling with a fresh yeast like CBC-1 to help it carbonate. 1/17/2019: When I opened a bottle a few days ago, it was only lightly carbonated. Tonight I flipped each bottle upside down and agitated it a bit to get the yeast back into suspension to improve carbonation (hopefully). I'll try another bottle Saturday night and see how it's doing. Back in June, I brewed my third attempt to clone the famous Tripel Karmeliet. While that version didn't taste like the bottled version of Karmeliet I'd always had, I happened to taste a draft version of the beer and it was a dead ringer for that. The difference between the two is that the draft version I tried did not have the fresh lemon notes I picked up in the bottled version. This time around, I'm trying to better replicate the bottled version. All the recipes I've seen used Hallertau Mittelfruh hops, which are described as mellow, spicy, and citrusy. I decided to use those in this version of the beer and add some lemon peel to see if that will help punch up the citrus flavors a little. 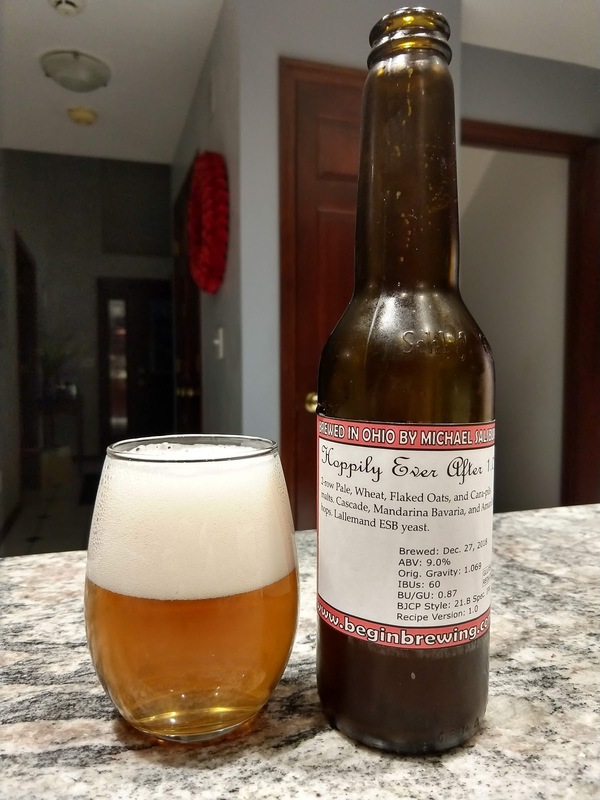 As strange as it may seem, the White Labs Sweet Mead Yeast produced a very good clone of Karmeliet on draft, so I'm planning to continue using it in this version. My last version also felt a bit more full-bodied than I wanted, so I'm adding a pound of corn sugar to this one to lighten the body and dry out the sweetness a little. I've also dropped the mash temperature a few degrees below what it was last time. This yeast likes a fermentation temperature in the 70-75F range. This time of year, my basement tends to stay around 64-64F, this will help offset any heat gains from the yeast (at least to some degree) but temperature control might be required at the height of fermentation. Last time around, the temperature got as high as 77F briefly, but stayed within 71-75F the rest of the time. My plan for this batch is to keep the yeast within the 70-75F range for the first 3 days of fermentation. After that, I'll hold it at 70F until it finishes fermentation. My plan after fermentation will be to bottle the beer using 5 carbonation tablets per 12-ounce bottle (high carbonation) and allow the beer to bottle condition for at least 2 weeks before serving. 12/14/2018: This was my third brew in the new Brewie+ system. My sparge and mash water calculation spreadsheet still needs work, as this beer came out at approximately 2.25 gallons (instead of the planned 2.5 gallons) and at a gravity of 1.089 SG. This works out to a Brewhouse Efficiency of approximately 59% for this batch, which is not great. Next time around, the Sparge water should be set to 1.6 gallons to get closer to 2.5 gallons in final volume. Interestingly, the Brewie application on Android estimated the gravity of this batch at 1.075 without the sugar and claims that its efficiency is 80%. I'm calculating that 2.25 gallons at 1.089 gravity is 59% efficiency. 12/17/2018: Gravity is down to 1.048 SG and the temperature is 65F. That's 39% apparent attenuation in 3 days, which seems fairly slow. On the other hand, the amount of yeast pitched was probably low and WLP720 works best in the 70-75F temperature range. It's well below that now. I may need to warm it up a bit. 12/18/2018: Gravity is down to 1.045 SG today. Since it looks like the yeast has slowed down considerably (probably due to the temp being 64-65F), I've added a heat wrap and some insulation, with a temperature controller configured to keep the beer at 70F, which is the low-end of the yeast's optimum fermentation temperature range. I'm hoping that will help the yeast get going. 12/19/2018: Gravity is down to 1.041 SG today. The temp has been raised to 73F, which is in the middle of the yeast's range. Fermentation continues to be fairly slow. 12/21/2018: Gravity is now 1.029 SG, so the temperature increase seems to have benefited the yeast. I raised it to 75F today to ensure that the yeast is able to complete the fermentation. 12/22/2018: Gravity is down to 1.018 SG. 12/23/2018: Gravity has dropped to 1.017 SG. 12/28/2018: Bottled the beer with 5 carbonation tablets (high carbonation) today. A warm, flat sample from the fermenter had a distinct lemony note to it like the real Karmeliet Tripel does, so I'm hopeful this will turn out to be a decent approximation. 1/4/2019: I tested a bottle of the beer today. The flavor was good, but there was no carbonation, or almost none. 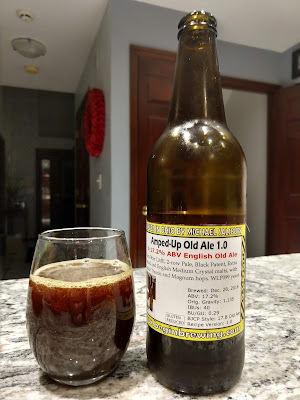 1/12/2019: Today I opened another sample of the beer. It had light carbonation, but not where it should be for a Belgian Tripel. Ignoring that for a moment, it's a mildly hazy gold color with minimal white head. The aroma is lemony and sweet. Flavor is malty, mildly sweet, lemony, with a balanced bitterness. If it ever carbonates it should be a good beer. 1/17/2019: The beer was not carbonated much last weekend when I taste-tested it. Tonight I increased the temperature of the hot box in which it's carbonating, flipped each bottle upside down, and agitated it to get the yeast back into suspension. Hopefully this will help with carbonation. I plan to do another test on Saturday. During Black Friday 2017, I was offered the opportunity to purchase a PicoBrew Zymatic at a significant discount. Although I'd already had (and been generally happy with) iMake's The Grainfather, I didn't brew as often as I wanted to with it. Although The Grainfather can produce some great beer (and I've got medals to prove it), the time commitment is hard to take. I pretty much had to stay home and watch over it for 5-8 hours, and attend to it constantly. For me, the Zymatic represented the opportunity to brew at times when I couldn't necessarily be there to change mash temperatures, sparge the grain, or drop things into the brew kettle. It would also mean that I could experiment more. Recipes I'd thought looked interesting (but didn't want to give up a day to try) would suddenly mean a few minutes' work to put together and a few more to load into the machine. Needless to say, I took the deal. Can you make good beer in the Zymatic? In a word, yes. I have a ribbon from the Ohio State Fair to back that claim up. 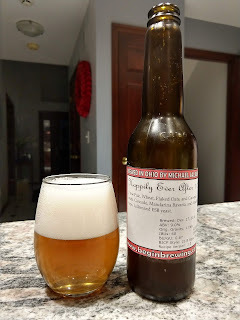 The second beer I ever made in the Zymatic (a Belgian Tripel) took fourth place at the 2018 Ohio State Fair's Homebrewing Competition. Considering how competitive that category is, taking fourth place with a beer brewed on a system I was only beginning to figure out should tell you all you need to know. What is it Like to Brew in the Zymatic? Log in to the PicoBrew web site and enter your recipe details, configuring the advanced mash settings if appropriate. Measure your hops, then load them into the hop baskets. Turn on the Zymatic and wait for it to connect to the Internet. Using the menu dial/button, select the recipe you want to brew, then press the button to start the brewing process. For the next few hours, the Zymatic will brew the beer according to the recipe you entered online. As it brews, the Zymatic will log temperature information on the web so that you can track the status of the brew. When the brew is finished, the Zymatic transfers the hot wort into the insulated keg and begins beeping. You can wait for the beer to cool naturally, maybe even placing it outside in the winter or into a refrigerator or freezer. This will take a long time and the beer will probably not be clear (if you care about that), but it will work. You can use the PicoBrew recommended approach. This is to remove the insulation from the keg (which is a bit risky since it's filled with near-boiling liquid), dunk it in a bath of ice water, an recirculate the wort in and out of the keg. This will take minutes, and the resulting beer should be relatively clear when finished. I took the approach of pumping the beer into a sanitized kettle, then using a sanitized immersion chiller to cool it. This took at most 5-10 minutes to do, given the cold ground water temperature and the small amount of wort relative to the chiller size. Later, I rigged a counter flow chiller up and used that, pumping wort directly into the fermenter through the chiller. This was also relatively quick, and reduced the chance for infection, but didn't chill the wort quite as well as the immersion chiller. You could probably rig up a number of other options, too, like a plate chiller or an immersion chiller that fits inside the keg the Zymatic uses. With the wort chilled, you transfer it to a fermenter and pitch your yeast. Although that process looks pretty long, it doesn't require tons of manual involvement. Recipe entry takes a few minutes, depending on how much tinkering you do. Loading the water, grain, and hops usually took me 10-20 minutes depending on how well organized I was. Chilling the wort usually took me 5-15 minutes. So my hands-on involvement for a batch was easily under an hour in most cases. Remove the Step Filter tray from the Zymatic. Dump the hops basket contents into a vessel for disposal. Scoop the grain out of the tray into the vessel for disposal. Rinse out the tray, hop baskets, and screens using hot water until no visible residue of the hops or grain is present. Place the screens back into the tray and put the tray in the Zymatic. Clean the keg using hot water, PBW, and a brush. Rinse thoroughly so no PBW is left. Load a vessel with hot water and attach the cleaning wands to the Zymatic in and out water lines. Start a rinse cycle, which takes about 10-12 minutes. Start a second rinse cycle. Dump the water out of the Step Filter and rinse it again. Load a Finish dishwasher detergent tab into the Step Filter, atop the hop compartment screen. Start the "New Clean Beta" cleaning program, which runs for about 2-3 hours. You can leave the machine at this point. When the cleaning program is finished, dump out the keg contents (dirty water), and the Step Filter contents (dirty water). Rinse out the keg and fill it with hot water. Rinse out the Step Filter and put the screens in it. Run the final rinse cycle in the cleaning program. This process takes about 3 hours of elapsed time. The hands-on involvement is about 15-20 minutes at the start of the cleaning process, and another 15-20 minutes at the end. The Zymatic documentation (and the PicoBrew web site) gives conflicting information on cleaning processes. The manual suggests doing a cleaning like the above after every 5-6 brews or after a single high-gravity brew. Zymatic support folks will recommend a cleaning cycle every 2-3 brews. My experience was that doing a cleaning cycle every 2-3 brews resulted in some internal clogging after some 25-30 batches. It took a double-digit number of cleaning and soaking cycles after that to get the Zymatic brewing smoothly again. For that reason, I began doing the above after each and every brew, as I wanted to avoid any further clogging issues. This cleaning process took longer than the cleaning process for The Grainfather. 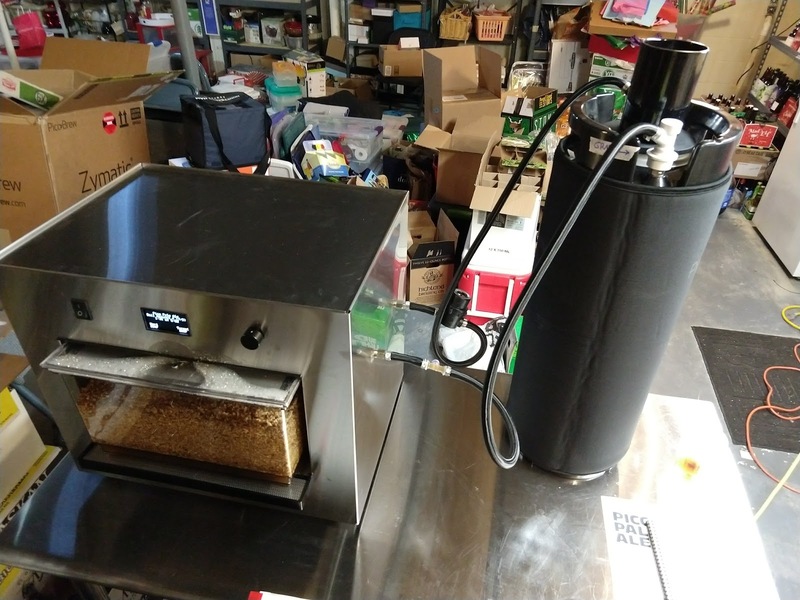 The Grainfather's cleaning process involved rinsing and scrubbing the kettle with PBW, then circulating hot PBW solution through the machine for a while. After that, you rinsed everything and you were pretty much done. It took about 20-30 minutes most of the time, but it was a bit back-breaking because of the bending over and lifting/dumping of the machine. Why Should You Buy (or Not Buy) the Zymatic? You want as much automation as possible. While the Zymatic automates the mash and boil processes (which are most of the all-grain brewing process), there are systems that also handle loading their own water and chilling the wort. You prefer to do 5 gallon or larger batches. You can get 5-gallon or larger batches out of the Zymatic, but it's really designed to do 2.5 gallons. To get a larger batch, you're going to be resorting to workarounds like brewing a higher-gravity wort and diluting it. You like really clear beer. In my experience with the Zymatic, it was hard to really produce a nice clear beer. Maybe that's a byproduct of it boiling at 207F instead of 212F. Maybe it's just the yeast strains I used. Maybe I didn't give it enough time to cold-crash, or give the finings enough time to work. But the beers I got from the Zymatic were never as clear as the ones I got from The Grainfather or from extract brewing. Money is tight. Even considering the discount I got on it the Zymatic isn't cheap. When you toss in the fact that it's not as efficient (in my experience) extracting sugar from grain as other setups, you'll be using more grain per batch than you might in a more-efficient system. You like brewing a lot of "extreme" beers. With its limitations on batch size, grain bill, and hop loads, the Zymatic may not produce the more extreme beer styles well. You may find that you're having to use a lot of "workarounds" like iterated mashing, bulking up with malt extract, or things like that. Similarly, if you're a hop-head who likes to brew beers that have many hop additions during the boil, the limit of four automated additions may not suit you. Internet access is a problem. If you don't have a good WiFi signal or a wired network port in your brewing area, you may find the Zymatic to be troublesome. It needs Internet access to brew, and it won't quite work without it. Noise is an issue. The Zymatic, to me, is fairly loud. Its diaphragm pumps run constantly during the brewing process, making "rat a tat tat" noises as they do. With it running in my basement, I could hear it from the top of the stairs. In a small apartment or home, I could imagine this being an issue for spouses, roommates, or neighbors. If, after considering all the above, the Zymatic looks like a good fit for you and your brewing needs - go for it. I found it to generally be easy to use. It produces good beer. It saves you lots of time on the brewing side, and can allow you to try recipes you might not otherwise want to invest the time in. It can also allow you to experiment with subtle changes like doing the same batch with different mash temperatures, different hop addition timings, or different hops loads. I've had a lot of fun with it, except for that period during August where it experienced the clogging problems. My experience with the support staff at PicoBrew was always great. They were knowledgeable, pleasant to work with, and informative. My only real complaint is that there's no "chat" or "phone" support option. Everything is email. Imagine that you try to brew on a Sunday night and hit a snag. You send an email. They answer on Monday while you're at work, and want you do check something or try something. You go home that night and take the action they recommend, then email them back. The next day you get a response, and so on. That's a large part of why I brewed pretty much nothing during August. I kept getting errors that caused the brew to abort due to a clog inside the system somewhere. They would suggest something, I'd try it and still get the error, and so on. It literally took weeks of this going around to solve the issue. Having a phone number to call might have made things easier. It produces 5-gallon batches (or smaller). You have control over mash and sparge water amounts, so hitting target volumes and gravities should be easier. It can load its own water from your household supply. 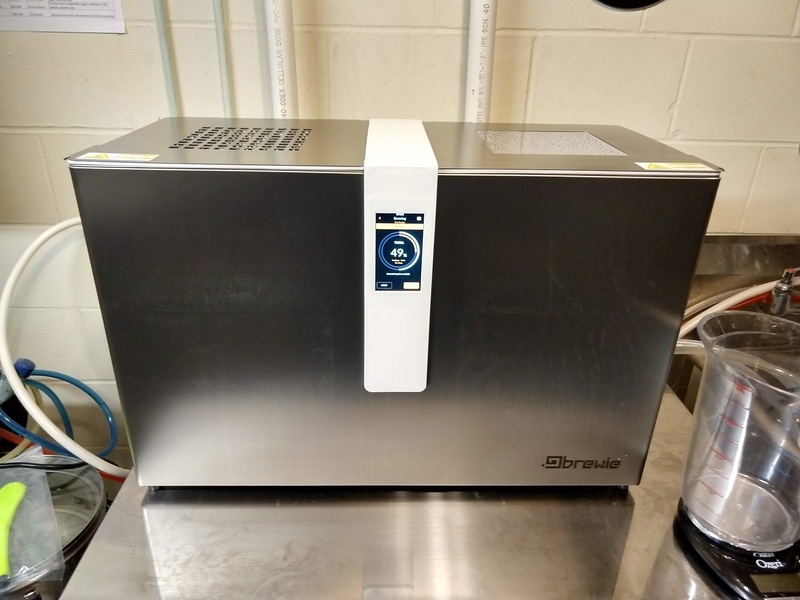 It can chill the wort to a yeast-safe temperature, automatically without any workarounds. Its mash and boil vessels are stainless steel and open for cleaning. This also means it's possible to more easily do things like read/adjust mash pH and read the gravity during the boil. Cleanup seems to be much easier and more automated. The touch screen makes interacting with the system easier, and it provides a much more detailed status of the brew in progress (including estimated time of completion). It boils at a temperature closer to 212F, which should help drive off DMS and potentially produce a clearer beer. It does not require Internet access to brew, so it can be used in areas with spotty or no Internet access. It's very quiet. You hear water splash about when it's filling the mash tun or transferring to the boil kettle, and an occasional whirring sound, but you can be standing nearby and hear almost nothing from it. That's not to say that it's perfect, either. It's a newer system, so there are more software glitches in the interface and the (beta) application for mobile devices. It has limitations on grain bill and hop loads like the Zymatic. And I'm sure I'll discover more as I use it more. What is the Tilt Hydrometer? In a nutshell, the Tilt Hydrometer is a small plastic tube with electronics inside it for measuring the temperature and gravity of a fermenting beer. It can transmit those readings outside the fermenter (including stainless steel fermenters) via Bluetooth to an Android, iOS, or Raspberry Pi device. The Tilt measures the gravity of your beer by the angle at which the device floats in the beer. The sensor inside the Tilt is a "military grade" sensor that is extremely sensitive. The Tilt is powered by a replaceable (and inexpensive) battery that will last a few months, depending on the frequency of use. If you want to use multiple Tilt devices, the manufacturer offers several different colored devices. Each color is registered differently by the iOS/Android/Pi application and tracked separately from the other colors. This allows you to place (for instance) a red Tilt inside an ESB, a blue Tilt inside an IPA, and a yellow Tilt inside a Belgian Dubbel while still tracking each beer's fermentation individually. How Do You Use the Tilt Hydrometer? Using the device is the really beautiful part. It couldn't be much easier. You clean it with dish soap and water before use. Then check the battery level by observing a blinking LED on the circuit board inside the Tilt. If the LED is blinking nice and bright, the battery is good to go. When you are ready to pitch your yeast into a beer, sanitize the Tilt using Star San or Everclear, and drop it right into the beer. It will begin collecting temperature and gravity readings, which it will transmit via Bluetooth to any device running the Tilt application. An inexpensive and convenient option is to setup a Raspberry Pi with the Tilt Pi software from the vendor's web site and place the Pi near your fermenters. What Information Do I Get from the Tilt? You then see a "View Cloud Log" link. If you configure the Tilt application to log its readings to the cloud, this link will be present. It will take you to a Google Sheets spreadsheet where the data is automatically posted every 15 minutes. That allows you to see and track your fermentation from outside your home network if you like. Note that this means leaving a device with Internet access (a phone, tablet, or Pi) in the vicinity of the fermenters, so that it can grab the readings from the Tilt and post them to the Internet. Below the big red bar, you see the "uncalibrated" gravity reading in smaller print and the calibrated reading (which are the same in this particular case) in large print. On the app, this is updated every few seconds. On the cloud spreadsheet, it's updated every 15 minutes (or at some other user-configured interval). Below the gravity, you see the uncalibrated temperature and the calibrated temperature (in this case they are the same). Below that in very fine print, you see the current date and time, the last time the app received a reading from that particular sensor, and the signal strength from the Tilt (which is another way to gauge the battery life). Earlier, I mentioned that the Tilt software can optionally log fermentation data to Google Sheets. If you choose to do this, a Google Sheets spreadsheet is automatically created for you and updated as new readings are recorded. The sheet has three tabs of information. This gives a quick overview of your fermentation over time. In the example above, you can see that my beer went into the fermenter on December 2, 2018, around 6:30pm. The original gravity at the start of fermentation (the "High" figure) was 1.073 SG. The current reading is 1.018 SG. That current reading represents an apparent attenuation of 75.34% and an ABV of 7.22%. You can also see that the temperature has ranged from a low of 64F to a high of 72.4F, and is currently 70F. In the above chart, the blue line represents the gravity of the beer over time. We see it beginning in the range of 1.073 SG and working its way down to the current 1.017 SG range. You can also see that I raised the fermentation temperature from 64 to 72F to help encourage the yeast to produce some esters I wanted. The last tab (Data) contains the raw data points captured by the Tilt. You can add comments there to indicate things you want to make note of (like adding fermentables, changing fermentation temperatures, etc.). There is little benefit to capturing all of this temperature and gravity data if it is not accurate. Fortunately, I've found the Tilt to be very accurate. When I've compared hydrometer and (calibrated) refractometer readings to the the Tilt's values, they're right on target (or at most 1 SG point off). The temperature readings, when compared to a known-accurate thermometer, are accurate as well. 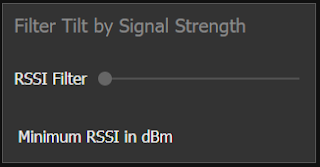 To adjust the calibration, select the color of the Tilt you're calibrating from the left-hand drop-down. Enter the correct SG value and the uncalibrated value for gravity. Do the same for temperature if needed. From there, the Tilt will automatically log and report the corrected (and uncalibrated) values. 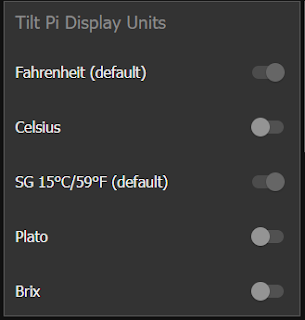 If you prefer to track temperatures in Celsius rather than Fahrenheit, this is an option in the Tilt app and Raspberry Pi GUI. You can also choose to use Plato or Brix rather than SG if you prefer, for tracking the gravity. 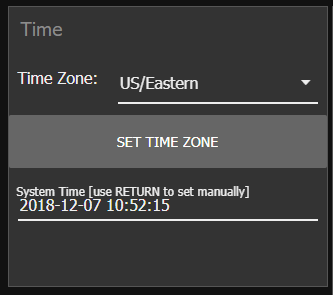 You can change your time zone as well. If you happen to be in a location where another homebrewer with a Tilt is nearby, or perhaps you have two Tilt devices of the same color, you can have the software filter out weaker signals so that you're monitoring your own fermentation and not someone else's. The logging functionality is also configurable. You can set the beer name displayed in the app, change the cloud logging settings, and log data to a USB flash drive if desired (on the Pi app). All of this makes the Tilt an accurate way to monitor your fermentation gravity and temperatures without having to open your fermenter or extract wort from it. The Tilt Hydrometer is one of my favorite and most-used brewing gadgets. It's simple to work with, accurate, and valuable. I can track the status of fermentation from wherever I happen to be, simply by pulling up the Google Sheet for that beer and checking the Report tab. The temperature values provide a good sanity check for my temperature control system, too. The Tilt has allowed me to gain insight into how various yeast strains work. 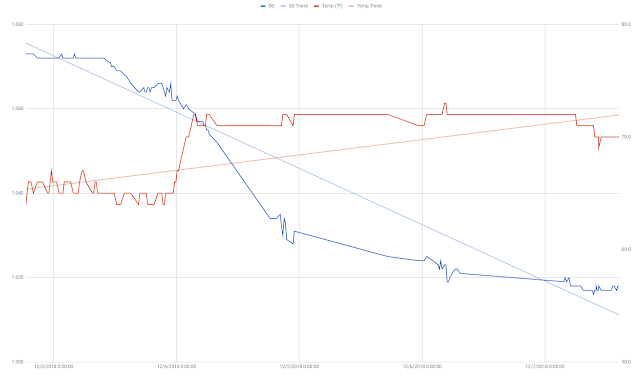 Its constant tracking of gravity and temperature helps me to see how long it takes a particular strain to start fermenting, gauge how active the fermentation is at any given point, and determine if I might need to rouse the yeast, raise the temperature, etc. It's helping me in another important way, too. In the past, I would either have to guess when the fermentation was finished, or take samples out of the fermenter and test the gravity to see if it was changing from day to day. That guesswork is gone with the Tilt. I can look at the readings over a period of days to see if the gravity has stopped dropping. If so, I know fermentation is finished and it's time to cold-crash and/or bottle. In practice, I've gotten about 3-4 months of life out of the batteries in the devices. If you brew less often, you might get more. I was able to buy a dozen replacement batteries for a few bucks. Replacing the batteries is a bit of a challenge, in that the cap(s) that are screwed into the ends of the Tilt's outer shell are incredibly tightly screwed on from the factory. Once removed, the circuit board is also pretty snug inside the tube, so you have to take care to push it out with enough strength to get it out of the tube, but not so much that you break the plastic parts inside. That said, I think it maybe took me 10 minutes to change the batteries in three Tilts and recalibrate them, so this is a pretty minor nit in the grand scheme of things. My only other issue is with the Tilt Pi software itself. About every 3 months or so, it seems to develop issues. It stops logging the readings to the cloud, either for brief periods of time or it just stops altogether. Rebooting the device doesn't seem to make much difference. In the end, I find that the simplest solution is to just wipe and reimage the micro SD card and reconfigure it for my WiFi. Again, this is a pretty minor nit to pick, but it can be frustrating at time. Is the Tilt helping me brew better beer? That's a little harder to say. It's certainly helping me reduce the number of overcarbonated beers I bottle. 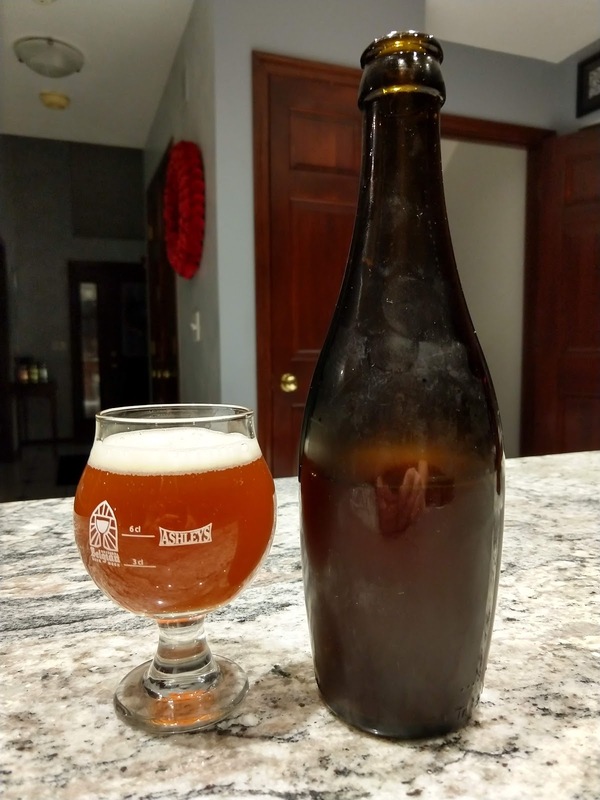 I think in the past I would assume that fermentation was complete when it wasn't, then prime the beer, bottle it, and find weeks later that the beer was massively overcarbonated. In fact, in a competition, that fact (plus the fact that I'd laid the bottles on their side while conditioning) cost me some points. The judge thought the residue on the side of the bottle indicated that I hadn't cleaned it thoroughly (not the case) and that the overcarbonation was due to an infection (and not over-priming). Overall, I find the Tilt to be a very useful and fun home brewing gadget. It's helping me understand yeast better, keep an eye on temperature control, and better gauge when fermentation has actually finished. If you can afford one or more (they're around $130 each), I'd definitely recommend it. Earlier this year, my wife and I tasted a Peach Cobbler Ale brewed by one of the Ohio breweries (I cannot recall which one, which is just as well). It was a nice enough beer, but for my taste it was a little dry and thin. 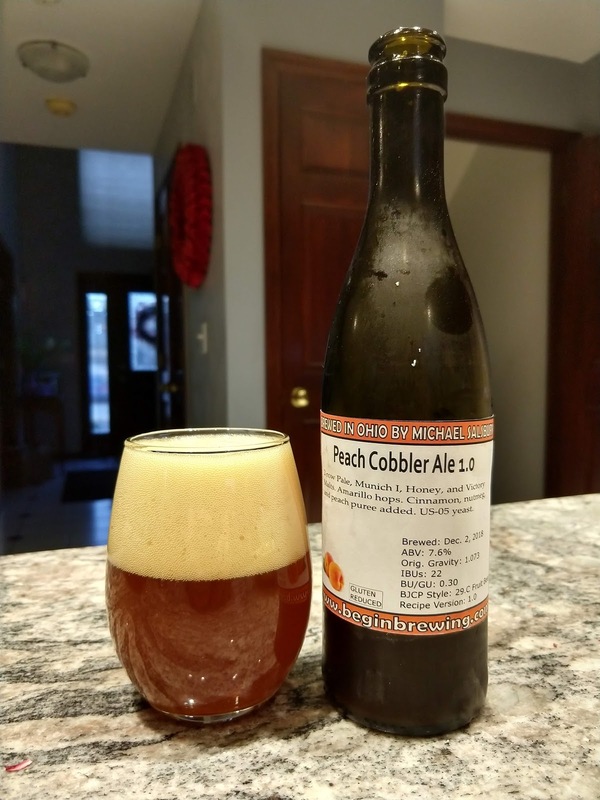 The peach flavor took a back seat to malt and hops, making it seem more like a Pale Ale with peach notes than a Peach Cobbler. Still, it inspired me to think about how I might brew my own version of the beer. For my version, I wanted a sweeter, more full-bodied base, reminiscent of a nice slab of baked peach cobbler. That means a higher mash temperature. I also want the crackery/biscuity notes of the malt to come through, to help the drinker imagine tasting a bit of crust. I'll use Victory Malt to try to achieve that. Some Honey Malt should help drive home the sweet cobbler illusion as well. Cinnamon and Nutmeg will be used as well, as these are common spice additions to a peach cobbler. Last bit not least is the choice of hops. When added late in the boil, Amarillo is said to impart citrus and peach type notes. I'm hoping those flavors will complement the peach puree used, and employing a single late-boil addition means no harsh bitterness and maximum flavor contribution, again helping to further the cobbler/dessert illusion. To ensure a nice peach flavor, I'll ferment the beer with a very generous dose of peach puree. If I don't get enough peach flavor from that, I may supplement with natural peach flavoring to punch it up. I'll use a clean-fermenting yeast with this, fermented low to keep it from generating any aromas or flavors that compete with the rest of the beer. US-05 is said by some brewers to be fairly clean, and in cases where it isn't, it tends to impart peach or apricot notes. If that happens, it will be good for this beer (where it might be undesirable in other). 1 tsp. Cinnamon @ 10 min. 1 tsp. Nutmeg @ 10 min. Once fermentation is finished, the beer will be treated with gelatin and cold-crashed for 3-7 days until bright and clear. Then I'll bottle it with 4 carbonation drops (medium carbonation) until it's ready to serve. 12/2/2018: The mash process went smoothly. Using the Brewie+, it was easy to do something I've not done before, which is to check the mash pH. It tended to hover between 4.9 and 5.2 during the mash, when checked periodically with an electronic meter. A gravity check during the mash, before the sparge, registered 1.060. After the sparge and pre-boil, it read 1.063 SG. This beats BeerSmith's estimate of 1.055 SG. Gravity with the addition of half the can of peach puree came up to 1.070 SG, and volume was shy of 2.5 gallons. With the addition of the rest of the can, gravity increased to 1.072 SG and volume hit the 2.5 gallon estimate. The aroma coming out of the kettle (without the addition of any peach puree) was decidedly peachy already, so I'm hopeful this and the Victory malt "crusty" flavor will blend with the cinnamon and nutmeg to give us a very peach cobbler-like flavor. 12/3/2018: Gravity is now reading 1.064 SG. That represents about 1.18% ABV and attenuation of 12%. I've read that increasing the temperature to 72F may produce some "peachy" notes, so I'm going to start gradually taking the yeast up to that figure. As of this writing, the temp is 65F but I've reset the upper temp to 71F. 12/4/2018: Gravity is down to 1.027 SG, and the temperature is 71F. That's 60.3% attenuation and 5.78% ABV. 12/5/2018: Gravity has dropped to 1.023 SG and the temperature is holding at 71F. That's 6.5% ABV and 65.6% attenuation. 12/6/2018: Gravity is down to 1.019 SG and the temperature is at 72F. I turned off the temperature control tonight to allow the beer to finish out at ambient temperature. 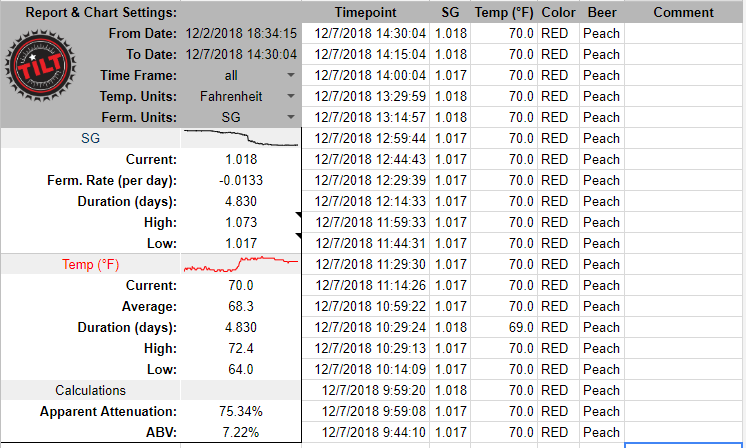 12/8/2018: Gravity is now registering 1.021 SG with a temperature of 66F. That's 76% attenuation and 7.77% ABV according to Brewer's Friend. 12/9/2018: Gravity is holding at 1.021. A sample of the beer from the fermenter revealed a restrained but clear peach note, a hint of cinnamon and nutmeg, and a touch of biscuity/crusty flavor. I'm hopeful that when it is bottled it will still deliver these flavors. 12/10/2018: Gravity is down to 1.019 SG. 12/12/2018: Gravity is now 1.018 SG. That means the beer is at about 7.6% ABV. 12/14/2018: Gravity has held at 1.018 SG long enough now that it's time to bottle. I bottled the beer today using four small carbonation tablets per bottle (medium carbonation). One ounce of Brewer's Friend peach flavoring was added at bottling. A sample of the leftover beer after bottling revealed a very nice peach cobbler flavor. 12/31/2018: The beer spent a while in a 76F hot box and did get carbonated, but seems in the process to have lost much of the peach cobbler flavor. There's a hint of peach left, and the barest hint of spice, but overall it's somewhat bland. I'm hoping it will improve some with age. I just acquired a Brewie+ automated brewing system. After I've gotten a few brews under my belt with it, I plan to do a compare-and-contrast post between iMake's The Grainfather, PicoBrew's Zymatic, and the Brewie+. For now, I'm working out how to use it properly. I can tell you already that the Brewie+ has a number of advantages over the Zymatic: up to 5 gallon batch size, larger grain bills, direct connection to your water supply, ability to brew offline, ability to sparge the grain, and automated wort chilling. It's also much quieter. On the other hand, recipe editing must be done on the device's touchscreen (until they provide you with access to their Android or iOS app, which isn't freely available online), and you need to do mash and sparge water calculations yourself. I'd been thinking about brewing a purported clone recipe for La Trappe Quadrupel. This is a really delicious Belgian Trappist beer, and one that I enjoy drinking. I just don't find it everywhere. If the purported recipe was close to the real beer, I'd be happy. This seemed like a good test for the Brewie+. The recipe I used called for Wyeast 3787 Trappist High Gravity yeast. This is purported to be the Westmalle yeast strain. Wyeast recommends a temperature range of 64-78F for fermentation, reports medium flocculation, and suggests that attenuation will be in the range of 74-78%. Online forums and reviews suggest that the yeast will be mostly dormant for about 12 hours, then will go crazy enough that a blow-off tube could be needed. It's said to generate a lot of sulfur and needs time to clean that up after fermentation. (I happened to notice a sulfur smell when I opened the smack pack, so I believe that.) It's said that the yeast will generate boozy flavors if it ferments above 74F. Denny Conn in one forum post said that he ferments this yeast at 63F for 4-5 days and then raises the temperatures after that to allow it to finish out. After that, I'll cold-crash it for 3-4 days and then bottle. 11/30/2018: The volume for this batch came out at 2.25 gallons after I instructed the Brewie to do a full drain including sediment. I suspect the extended boil is partially responsible for the lower volume. The gravity should have come out about 11 points higher according to the calculations I ran before brewing, but perhaps the Brewie isn't as efficient as it's estimated to be. Any time you use a new brewing setup there are always adjustments to be made to the process and calculations. A few more batches and I'll hopefully be able to dial it in and get closer to my expected gravity and volume figures. Brewhouse efficiency on this batch, according to BeerSmith, was 51.4%. 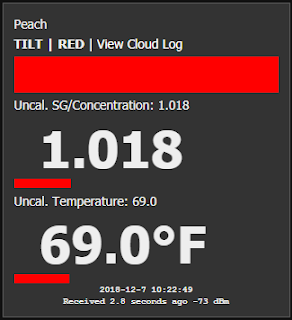 12/1/2018: The gravity has dropped to 1.088 SG but the temperature has held at 64F. That's around 4.6% attenuation, which is not surprising. This yeast is known as a slow starter and it's being held at the low end of its temperature range, so I don't expect major drops in gravity for a while yet. 12/2/2018: The gravity is now down to 1.052 SG. I bumped the temperature up to 65F. This represents approximately 43% attenuation. 12/3/2018: Gravity is now 1.041 SG. I've bumped the temperature up to 67F. That's 54% attenuation and an estimated ABV of 7.76%. 12/4/2018: Gravity is now 1.032 SG, the temperature has been bumped up to 71F. That's 65,6% attenuation and 8% ABV. 12/5/2017: Gravity is now 1.022 SG, and the temperature has been raised to 75F. That's 77.4% attenuation and 9.45% ABV. 12/6/2018: Gravity is now 1.018 SG, and the temperature is up to 76F to encourage the yeast to finish up. 12/8/2018: Gravity is down to 1.014 SG, with temperature holding at 76F. According to Brewer's Friend, that represents attenuation of 84% and an ABV of 11.4%. The real La Trappe Quadrupel is 10% ABV, has a color of 36 EBC (approximately 18.3 SRM), and a bitterness of 22 IBUs. This version has a color of 13.7 SRM (estimated), bitterness of 29.6 IBUs, and ABV of 11.28%. This one, most likely is going to be a bit lighter-colored, more bitter, and more alcoholic. The real recipe (per the La Trappe web site) contains Munich, Pale, Caramel, and Roasted barley malt, glucose, hops, and yeast. If this doesn't turn out particularly well, it will be time to try mimicking their recipe (rather than relying on this one, which was published somewhere online). 12/9/2018: Gravity is reading 1.015 today, which seems to suggest that fermentation has slowed or stopped. 12/10/2018: Gravity is still 1.015 SG. 12/12/2018: Gravity has held at 1.015 SG now for about 5 days. I think it's safe to say we've hit the final gravity for this batch and will need to bottle the beer soon. 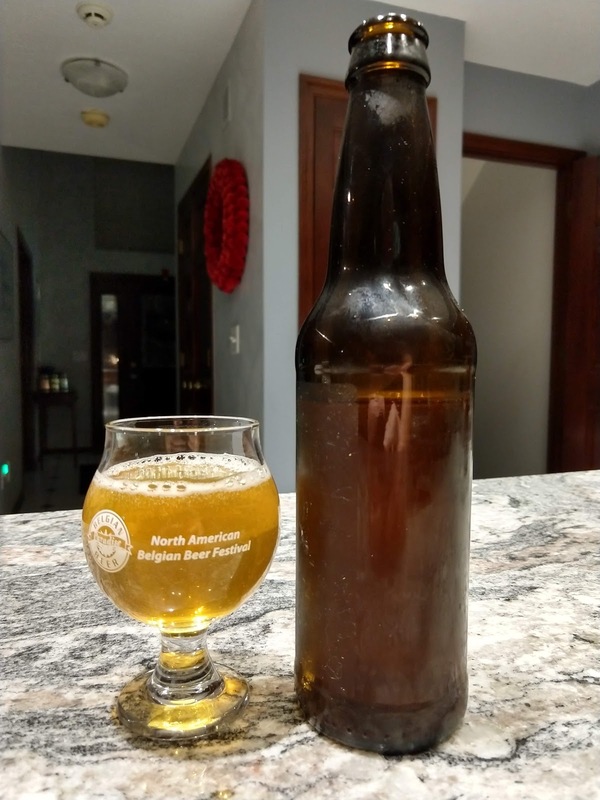 12/31/2018: The beer has been bottled for a couple of weeks now, but has yet to carbonate. I've tried a trick that has served me well in the past (turning the bottles upside down one day, then right side up the next) but it hasn't changed things. I'll have to try another trick if there's no carbonation in another week or so... rehydrating some dry wine yeast, bringing it to krausen, and injecting some into each bottle with some additional priming sugar. 1/6/2019: I rehydrated some CBC-1 bottle conditioning yeast and added some leftover Quadrupel wort to it along with a pinch of yeast nutrient. When it began to krausen, I uncapped a bottle, dropped two small carbonation tablets into it, and a pipette full of yeast slurry. In the past, I've been successful getting beers to carbonate with this approach, provided I keep the yeast in suspension by moving it around every couple of days (inverting the bottles and standing them back up). 1/12/2019: I chilled and poured a bottle of the beer tonight (see photo at the top of the post). Thankfully, the CBC-1 yeast came through and has carbonated the beer - though not quite to where I want it yet. I'm hopeful with time it'll get there. 1/17/2019: To ensure that the yeast finishes up the carbonation, tonight I flipped each bottle upside down and agitated it to get the yeast back into suspension. Hopefully when I do my next taste test on Saturday it will be properly carbonated.